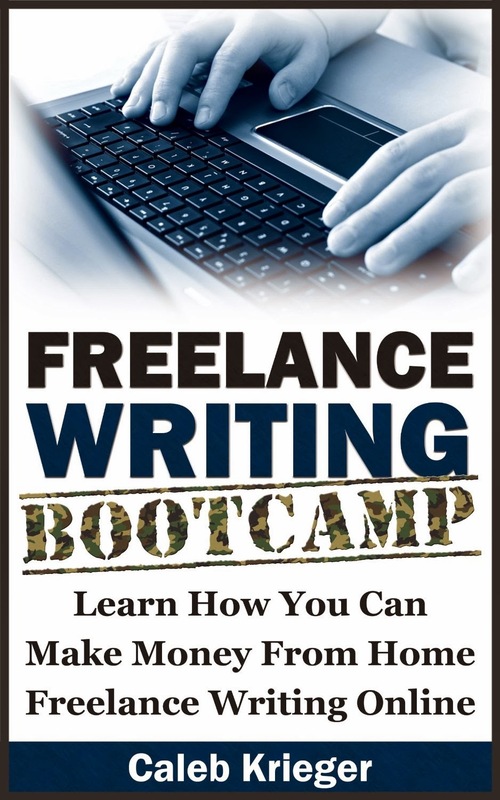 In the introduction of FreelanceWriting Bootcamp: Learn How You Can MakeMoney from Home Freelance Writing Online, Caleb Krieger unabashedly admits that his ebook is short. That's the way he prefers it. He wants to get right down to the nitty gritty so readers can go out and make money as writers. Think of this book as a comprehensive CliffsNotes guide to becoming a freelance writer. The book contains six chapters. If you're a new freelance writer, you'll likely find all of them important. If you're an experienced writer, you'll still likely benefit from the last few chapters. The majority of this chapter is written for the complete beginner. Krieger gives 14 tips that will help you survive as a freelancer including grow thick skin, learn how to handle loneliness, and set up a dedicated space to work. As an experienced freelancer, I would agree that all 14 of these tips are necessary to survive and thrive in the freelance world. Krieger begins by covering the content mills and then bidding sites like Elance and oDesk. Next he moves on to online residual income writing sites. Of course, he also mentions creating your own blog/website, though he warns that this isn't an easy or quick way to make money. Then he hits on the strategy that is, in my opinion, most likely to be successful--querying blog and website owners to see if they need writers. Krieger gives plenty of suggestions for discovering topics you may be able to write about and how to search for blogs that cover these topics. Too many people try their hand at freelance writing, but treat doing so like a hobby. This is a mistake. Krieger hits on all of the typical freelancer mistakes--not budgeting your time or money wisely, not paying quarterly taxes, and not having enough confidence in yourself to continue on even when getting your business off the ground is more difficult than you imagined. Krieger hits on many common mistakes that freelancers make in the beginning that can cost them money and clients. Some of the mistakes include overestimating your writing speed and procrastination. Krieger also hits on one of the most important ones--not charging what you're worth. For each of the mistakes, he offers several solutions. The suggestions on increasing your rate are important because far too many writers don't charge what they're worth. Krieger offers strategies to improve your writing. As you do so, you should be able to break into other niches and be able to write other types of copy. The more you can do this, the greater the potential that you can increase your income and your client base. Krieger has saved the best for last. We all want to learn how to make more money, and Krieger doesn't disappoint. He gives strategies to earn more money. He also gives sample templates that you can use with your own customers when asking for a raise. Rather than have resources at the end of the book, Krieger sends readers to another web page to submit their name and e-mail address. Then, once signed up, you'll receive a pdf with over 75 links for everything from content mills looking for writers to the best job boards on the internet. Krieger promises these links will be updated and sent to you as they change or new ones are added. If you're contemplating becoming a freelance writer or you've just started down that path, at $2.99, this book is a great deal. The extras and the advice in the sixth chapter alone make it worthwhile. If you're an experienced writer, you may not find as much value in this book. However, if you have trouble negotiating for pay raises, you may still benefit from this book.